Low prices direct to you from Ask Noah. This work was inspired by the book Sefer HaMadah (The Book of Knowledge), which is the first volume of Mishneh Torah, by the great Rabbi Moshe ben Maimon (Maimonides, or Rambam). As the first part of his monumental codification of the Oral Torah, it explains the Torah’s path to true and proper faith-based knowledge. What the world has been lacking until now is a parallel book written specifically for the fundamentals of faith that apply for Gentiles (Non-Jews), because much of the content of Rambam’s work applies only for Jews. The essential points of our present book, and much of its text, have been taken from the universal parts of the holy words in Sefer Ha’Madah, Beyond that, we have added a great amount of background information and explanations to produce a book that is intended specifically for those who are, or who want to become, righteous and pious Gentiles – Noahides, in modern terms – in G-d’s eyes. 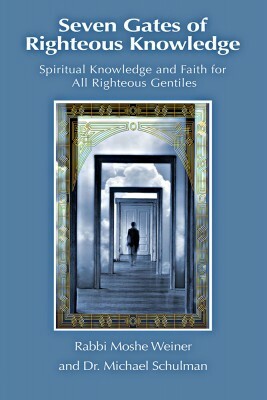 In this book, we have included many of the proper and righteous outlooks, character traits, and goals for life that will provide much-needed guidance for Gentiles who are searching spiritually for an authentic personal connection with the One True G-d. In summary, this book presents the proper views and behaviors for Righteous Gentiles of any nationality or culture, and it will serve as the next milestone for the modern Noahide movement. Love this book! Easy to read but packed full with deep thoughts. After finishing it I felt like starting all over again. If you want to know Torah’s path to true and proper faith-based knowledge, this is the book for you! I just started reading about Noahides a about a month ago. I have been searching for HaShem for a few years now and have been stumbling on books like this and have been thoroughly pleased at how understandable and easy to read they are. Great help in my journey as a fulfilled human being. Excelente libro! Muy recomendable para todos los bnei Noaj. Finally, a book of Jewish philosophy and ethics specially made for Non-Jews! It will surely help the growing group of Noahides worldwide to develop the right motivation for the right actions in order to lead a fulfilling and happy life in accordance with the Will of our blessed Creator, as revealed in the authentic Teachings of the Jewish Sages.